Black lights are not only neat, they can actually be quite useful. Crime scene analysis. Counterfeit money detection. Detecting leaks in machinery. These are just a few of the ways black lights come in handy. Have you ever wondered, though, why certain items or fluids glow under these specialty lights and others do not? For students that enjoy life science and, of course, making things 'glow', check out the project resources below. Learning about UV light, the electromagnetic spectrum, phosphors, luminescence, etc. 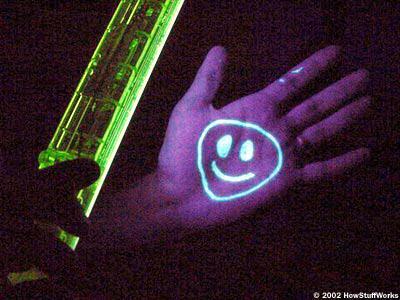 will help you predict what objects will/will not glow when placed under a black light. Make Glowing Water. Great background information and demonstration of how phosphors react when placed under UV light. How Black Lights Work. Provides background information on black lights and their uses. Making Things Glow in the Dark. Great background information and demonstration of how phosphors react when placed under UV light. Materials That Glow Under Black Light. A great list of materials to consider including in your experiment. Good Hand Washing? Turn on the Black Light! Great application for black lights! See how they can help detect good/bad hand washing practices and provide a way to find out if some places are harder to clean than others. These resources will provide you with a great start on your project!